Dust storms are serious meteorological events that affect the East Mediterranean region, primarily during the spring season. The physical and chemical nature of dust storms, their origin, and the meteorological conditions leading to the generation of storms have been fully documented, but knowledge on their biological content is almost nonexistent. Four dust events that occurred in the period 2004–2005 were sampled in Haifa, Israel, an urban area on the East Mediterranean coast, for biological characterization. Samples were taken before or after (depending on the meteorological conditions) as well as during the dust events. Dust particles were collected as two size fractions using a dichotomous sampler, and their elemental content was determined using X-ray fluorescence analyses. Airborne bacteria and fungi were collected with the Six Stage Andersen Viable Impactor. Fungi were identified by optical microscopy. Compared to adjacent clear days, there was an increase in the concentration of both atmospheric particles and elements of geological and marine origin during the dust events. The concentration of airborne microorganisms during the dust events was also higher, and the fungal population content was affected. On a winter clear day the abundant airborne fungi were Paecilomyces variotii, Penicillium glabrum, and Alternaria alternata. On a spring clear day, the persisting airborne fungi were Alternaria alternata, Geotrichum candidum, Penicillium chrysogenum, and P. glabrum. However, during two dust events the fungal population was dominated by Alternaria alternata, Aspergillus fumigatus, A. niger, A. thomii, Cladosporium cladosporioides, Penicillium chrysogenum, and P. griseoroseum. 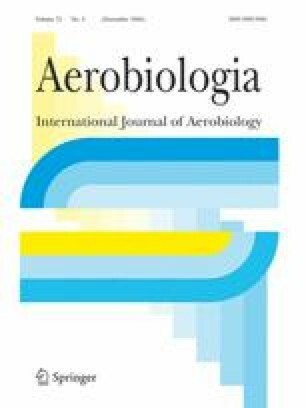 This study suggests that Saharan and other desert dust events in the East Mediterranean have a significant effect on the airborne microbial populations, which might impact on health, agriculture, and ecology. Special thanks are to be extended to Dr. Colin Bloch from Hadassah Ein-Karem, Jerusalem, for lending us the Six Stage Andersen Viable Impactor, the Technion for providing a stipend to one of the authors (P.S.) and the Israel Ministry of Environment.